Contents: Celebrity Quiz cards (100 in total, 50 of which are famous non-Japanese and 50 are famous Japanese.) Celebrity Quiz Question Sheet. The class is divided into two teams; each team should decide on its name. The teacher asks one student to be the Scorekeeper. The Scorekeeper keeps the individual question score and the team scores on a blackboard in frotn of the class. Student recieve a copy of the Celebrity Quiz Question Sheet. The teacher says the questions; then students repeat. This is pronunciation review and a chance for students to understand the meaning of the questions. After the students have warmed-up with the Celebrity Quiz Question Sheet, they are ready to begin. 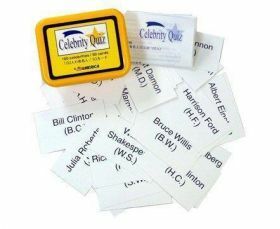 The teacher puts all the Celebrity Quiz Cards in a bag or box. Then one student from one team selects a card. He looks at the card, goes to the front of the room, puts the card face-down and writes the initials of the celebrity with first name first and last name last on the blackboard. (For example, Harrison Ford would be H.F. and Ken Takakura would be K.T.) The student says WHO IS IT? And his team members fire questions away at him from their copies of the Celebrity Quiz Question Sheet. He can only say YES or NO to the questions. As the questions are asked, the Scorekeeper keeps track by recording the number questions. The team oly has 20 chances to ask questions. If they cannot guess who the famous person is, then they receive no points. If they do, then they get a point, and the next team goes. 1. It is important that only one team members from the same team shout out the questions. The opposing team member should be quiet because they don`t want to help their opponents! 2. 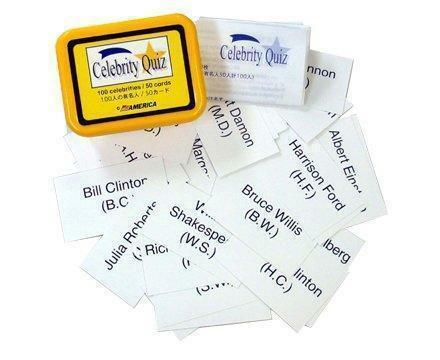 If the team members cannot think of any questions, the Celebrity Quiz student can give a hint, but each hint is counted as one question, so the Scorekeeper should record it. 3. The Scorekeeper has two scores to keep: the team wins and the 20 question allotment to each team. 4. If only one person is playing, then the teacher and the student can take turns being the Celebrity Quiz person. The team with the most wins is the winner!